That was essentially his department’s response to my latest request for a copy of the contract – the third time my request was deemed so unclear that nobody at the Department of Education could understand which records I was asking for. I even told them the best place to look for the records – the Secretary of Education’s Office. But it still wasn’t clear enough for Tomalis’ crack staff to mount a hunt for the elusive contract that both Penn State trustees and public officials have so far refused to divulge. 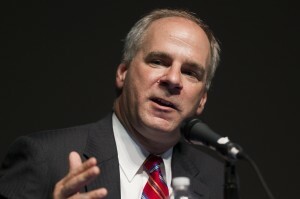 Tomalis was second in command of the trustees’ so-called “committee” that oversaw Freeh’s investigation. He, along with Ken Frazier, directly communicated with Louis Freeh and his general counsel. The OOR analyzes right-to-know requests to determine whether or not … an agency can “identify the type of information being sought.” The decisions have considered factors such as time frame, type of record sought and subject matter. If the request contains sufficient descriptive information in any or all of those categories to enable an agency to discern what information is sought and locate responsive records, it will be ordered to produce them. My request specified the type of record (contract, memorandum of understanding, etc.) that I was asking for, as well as a party that signed the document. It’s certainly consistent with this decision. But let’s be honest: these people don’t care about the law. Even a neanderthal knows what I was asking for, and arguing the merits of any records denial is an exercise in futility. No matter how unethical and illegal the department’s response might be, it’s a smart move on their part because it allows Tomalis to dodge a perjury charge. He previously said he didn’t have the contract, and denying access to the record would prove its existence, thereby making him culpable. Using the “not sufficiently specific” response is one of his only ways out. Bravo. I immediately appealed the department’s decision to the Office of Open Records. But that place is still part of the Corbett-controlled executive branch, and I have no confidence in its ability to render judgements in accordance with either court rulings or its own opinions. We’ll know in 30 days whether that place has any integrity or not. But it’s clear Tomalis and his staffers will never willingly release the contract. And why should they? The Right-to-Know Law lacks any incentive for state officials to comply with its demands. There are no criminal penalties for violating the RTKL. They can face civil penalties of up to $1,500, but that’s supposed to be paid for by the state agency, and only after somebody sues and wins, which nobody really does. The only way to win this game is to put some of their own skin in the game. That’s why I’ll be hiring an attorney to start a civil suit against Bressi, Tomalis, and their attorney for denying access in bad faith. The $1,500 penalty itself isn’t a real deterrent. But making Tomalis and his top deputies give deposition after deposition at some point will add up, and hopefully send a message that they’re not above the law. I’ll also be pursuing a private criminal complaint against Tomalis for claiming that the contract didn’t exist. But I might wait until the new Attorney General is sworn in. Until then, I’ll continue filing requests for information, hoping at some point they realize it’s easier to just be transparent instead of keeping secrets. Hi Ryan – thank you for everything you’re doing to keep the pressure on the BOT and Gov. I wonder if it would change the discussion at all, if the headline called out Taggart’s day job more clearly….may get more attention outside PSU circles…. Take it or leave it….may drive some buzz. Thank you again. Where can we send donations for the legal fund? Ryan I appreciate the effort but you’re going to lose. Taken on its face, without comparing to first two requests, as would be the standard of review, your request is way to broad in time and subject matter. You can’t expect the department to scour decades of records to look for one party to a contract. Thanks Josh. Actually, the OOR’s standard is this: “If the OOR can determine what the Requester sought, it will find the request to be sufficiently specific.” See Lauff v. Fort Cherry School District, OOR Dkt. No. AP 2010-0128, which the OOR actually cited in its denial. Can you figure out what I was looking for? Also, in that same case, the OOR said it doesn’t matter how much work it takes to look for a record, the agency still has to do it.However, I did re-file the request with a date restriction. But, like I said, this isn’t about whether my request is sufficiently specific in the department’s eyes. They will never, ever willingly release this document unless somebody orders them to. Kudos to you, Ryan. The abuses in this case are mind boggling. Why can’t the bot and the Department of Education come clean. There is a contract or there is not. Why should have to ask six times and take them to court? What are they hiding? I, personally, hope you find out, and share with the world. Thanks for this, Ryan. The stonewalling is unbelievable — glad you’re making him (and ultimately “them”) squirm. I’d be glad to pitch in. Ryan, thank you very much for doing this. With people like like you, the truth will come out! If there was no contract, then Louis Freeh and his company must have investigated on their own, without authority. Therfore the finding must be totally invalid and the NCAA had no reason to impose their unjustified sanctions..
You need to fill out a freedom of information request…make this official…get it on record. There is a petition being circulated to try to pressure the feds into investigating all of this mess, especially the NCAA and how it handled the Sandusky matter. In addition, I believe there should be a discussion in reference to a Congressional investigation. I contact U.S. Rep. Joe Pitts (R-Lancaster) and was told that the NCAA is not under congressional auspices. Hello? I thought anything within the geo-political boundries of the USA was within congressional auspices. There is no doubt that an influence from outside of our state has caused a great deal of negative economic impact on the citizens and businesses of central Pa., and there is also no doubt there was no recourse available to those businesses or citizens. If Congress cannot step in, who can? Perhaps you could be the new voice of this cause? Sad how the new “openness” that the PSUBOT is embracing isn’t really very open.